Simple Stories: Always & Forever Paper Collection, Bits & Pieces and Sn@p! Cards. Southern Ridge Trading Company: Wood Piece. Ranger Ink: Black Soot Distress Ink, Tarnished Brass Distress Crayon, Black Soot Distress Paint and a Blending Tool with Foam. Scrapbook Adhesives by 3L: 3D Foam Squares and EZ Runner Pernament Tape. 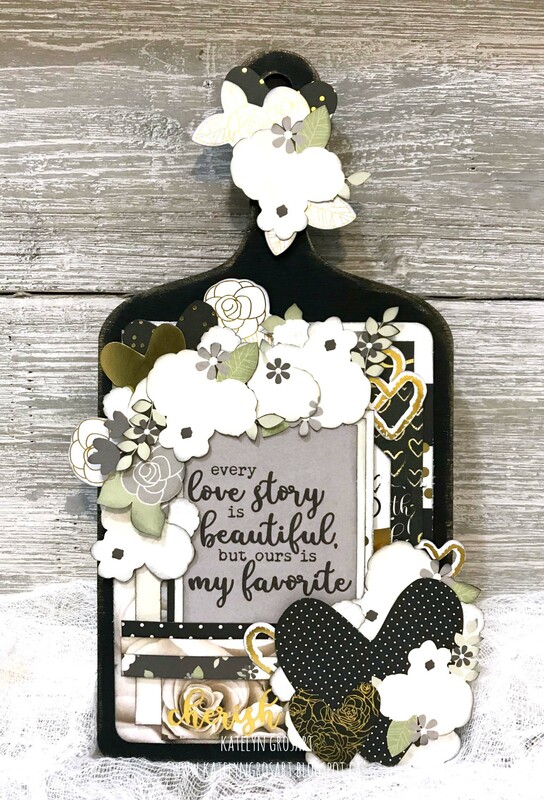 Always & Forever Collectionhome decorKatelyn GrosartRangerscrapbook adhesives by 3LSimple StoriesSouthern Ridge Trading Co.
Hi, OMG and WOW, I Never like to copy someone’s project but maybe just be inspired by it BUT I have to say for the first time I want to copy this!! I think this is just beautiful and amazing and ” SO ME “. I would love to have this hanging in my scrapbooking room, I am so in love with it. I have been spending so so much out of my budget with all the new releases coming out so I can’t afford to buy everything now, but you bet I will be saving this post and I will be getting this sometime, once again an amazing job, very unique, love it.